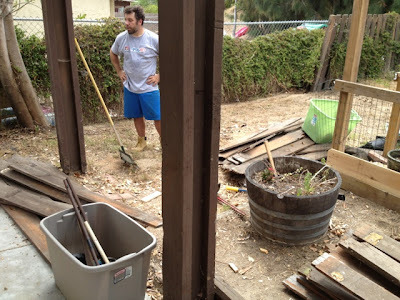 If you've been following my blog, you will see that we do a lot of DIY yard, home improvements, and decorating projects. Our list of projects that we want to get done is looooong. My husband works full-time so he can only do so much. I am busy taking care of my family, my blogs, writing etc. so I have a limited amount of time I can put into these projects, too. However, we enjoy doing it and are saving a ton of money doing everything ourselves. Sometimes I feel like things that we really want to do will NEVER get done because we are constantly dealing with things like, oh, I don't know - our fence falling down!!! This was bound to happen. The fence was destroyed by termites. This is not a quick fix. The entire thing needs to come down. The fence project was on the list. It was just behind finishing the desert portion of our front yard (we are close), the stucco at the base of our house in front (about 1/8 of the way done), and planting the gardens in front of the finished stucco (not started). Now, the DIY fence replacement is bumped to the top of the list because the nasty chain link, that has limited privacy due to renegade ice-plant, is just not an acceptable or attractive fence partition. It is also falling down from the weight of the ice plant, so it is probably only a matter of time for the 2nd fence to fall, too. Thank goodness for the 2nd fence during this transition. With dogs on both sides, and neighbors where a good fence is necessary, we are lucky for this backup fence. We calculated how many hours we thought it would take for 2 people, who have no clue what they are doing, to replace the fence on this side of the yard. Not even including the fence on the opposite side, which can wait until after we replace the fallen side, it seems like it could be a 200 hour project! Spread out over weekends and holidays, this could take us a year to finish! Hopefully we estimated a little high on our calculations. Either way, the home improvement budget only allows for free labor (us), or we will have to cross more nice-to-have projects off the list. We are going to go for it, on our own. My fence and gate blew down also. What a pain to get fixed, thank goodness my son in law could do it for me.